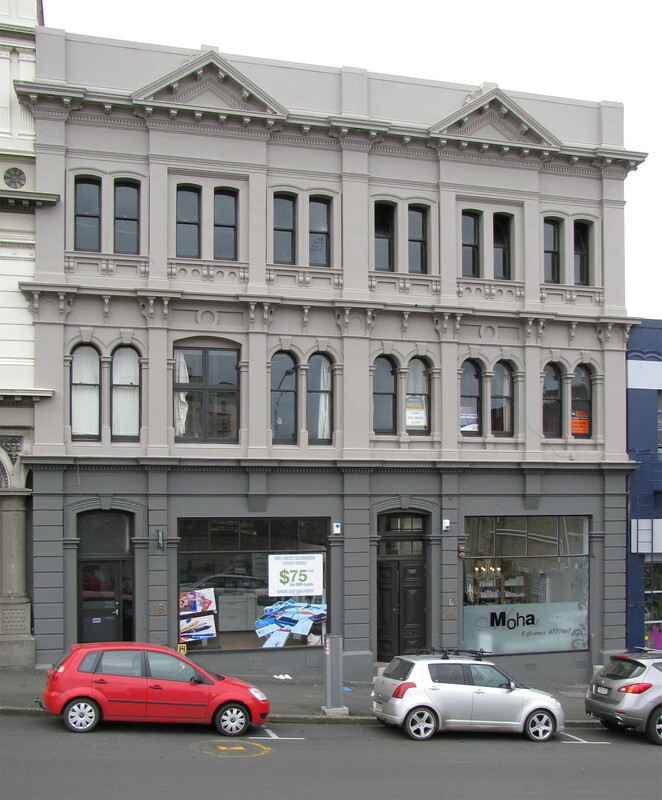 Just one door down from Milford House is a building that isn’t in any publications about Dunedin architecture. That’s probably because, though a handsome Victorian warehouse, it’s one of the more modest and understated. The DCC and others looked into its history but didn’t discover the year it was built or who the architect was, so it posed a bit of a challenge and a chance to carry out some fun detective work. Hallenstein Brothers’ records at the Hocken hold some answers. Letter books and lease records show that following the completion of his factory, Bendix Hallenstein employed James Hislop to design both this three-storey building and the adjoining two-storey building at no.12 (now part of the Les Mills gym). In July 1884 Hallenstein wrote to his brother Michaelis informing him that he had accepted a low tender of £2,995 for the construction and added: ‘there is hardly any building going on or else we should have had to pay considerably more’. The long depression saw work dry up for builders and architects. There were some cost overruns (the final amount paid to contractors Anderson & Godso was £3,443) but the buildings were ready for occupation before the year was out. Nos 14 and 16 have a firewall between them, so they might be thought of as separate buildings behind a single facade. The first tenants at no.14 were Philip and John Isaacs (wholesale agents), while at no.16 were Dodgshun & Co. (woollen importers). Neither remained long and the tenant that became most associated with these addresses was Ahlfeld Bros & Co. They took over the lease of no.14 in 1889, and a few years later took on no.16 as well. 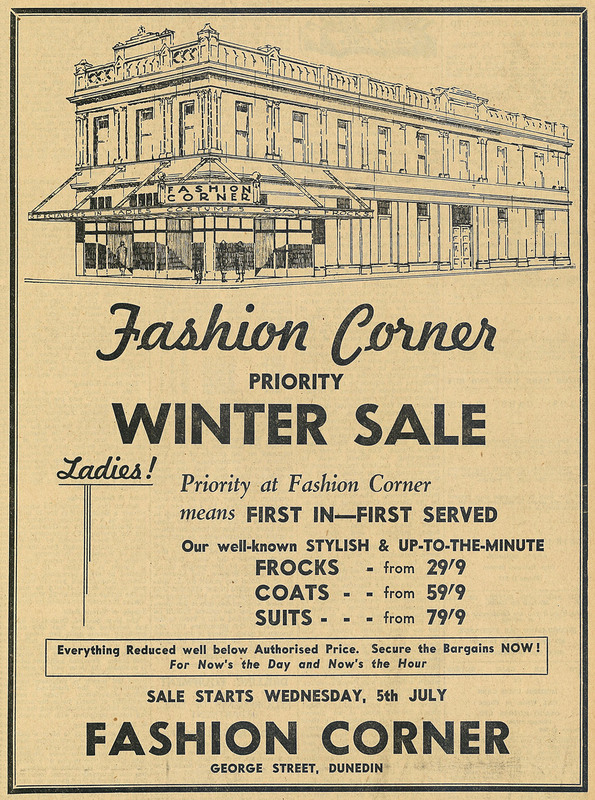 They were fancy goods merchants and importers, whose stock included Wiesner pianos, Anchor sewing machines and bicycles, Gaedke’s cocoa, and ‘Silver and Brilliant Packet’ starch. They claimed to have branches in London, Hamburg, and Paris. I haven’t found many references to the firm in old news columns, but the sensational divorce case of Adolf Ahlfeld, in which one of his employees was named co-respondent, made national headlines in 1893. There was another scandal in 1905, when local police constables were found to have been criminally involved in a series of burglaries of Ahlfeld Bros and other businesses, and the receiving of stolen goods. Ahlfeld Bros were in the building until about 1916. 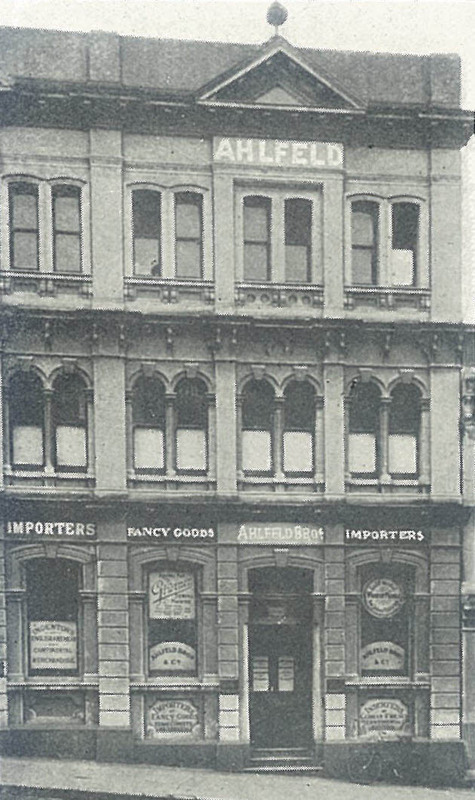 Later tenants at no.14 included Gordon & Gotch (wholesale booksellers and stationers), Partridge & Co. (tobacco merchants), the British General Electric Co., A.R. Dickson & Sons (plumbing, heating, and sanitary engineers), and Ambler & Co. At no.16 tenants included the Bristol Piano Co. and R.E. Stevens & Co. (stationers). The flats above were leased by various people and groups, including lawyers, the Scouts’ Assocation, and the Second New Zealand Expeditionary Force Association. The clothing factory and Glendermid businesses next door also expanded into the buildings for periods. The architect, James Hislop, had his own professional rooms upstairs in the smaller building at no.12, above the jewellers Berens & Silverston. 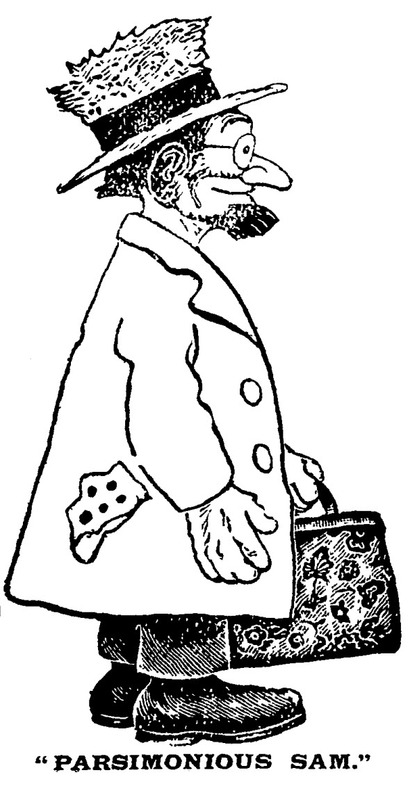 Hallenstein’s tenants were often other members of the Jewish community. 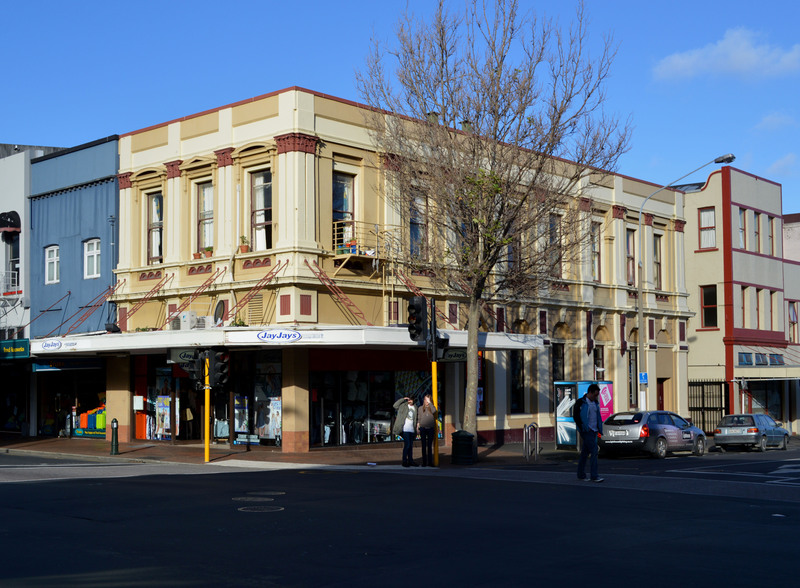 Hislop is a signficant name on any list of Victorian Dunedin architects, although he has been under-researched and much of his work remains unattributed or little recognised. His Moorish-style main building for the New Zealand and South Seas Exhibition of 1889-1890 was one of the most exotic-looking pieces of architecture ever seen in Dunedin. 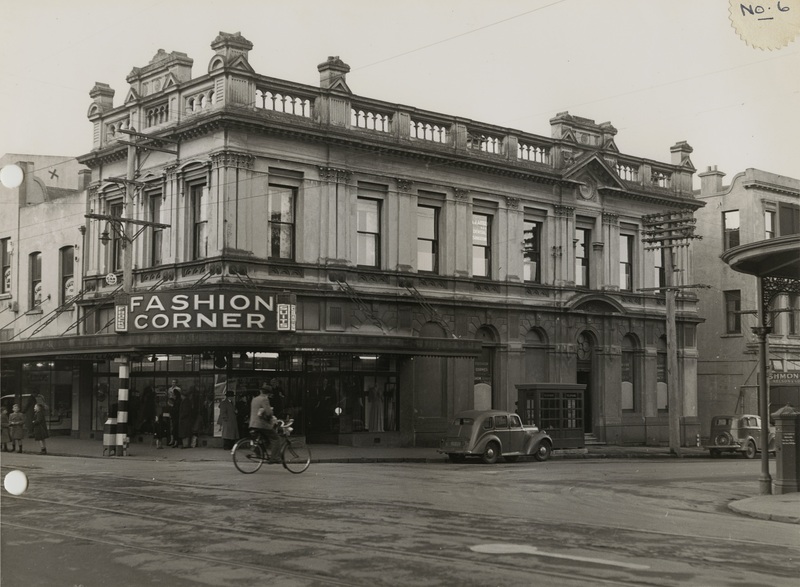 His most familiar design in the city might be the corner portion of Mollison’s building (facaded and now Westpac) on George and Hanover streets. There are many parallels between Hislop and J.A. Burnside and when I think of one I often think of the other. Burnside was born in New Zealand in 1856 and Hislop was only a year old when he arrived in the colony in 1860. Both men grew up in Dunedin and both were articled to Mason, Wales, and Stevenson in the late 1870s. Hislop went into his own practice in 1880, just a year behind Burnside. They were at the front of a new generation of emerging New Zealand architects that succeeded the generation of Lawson and Ross. 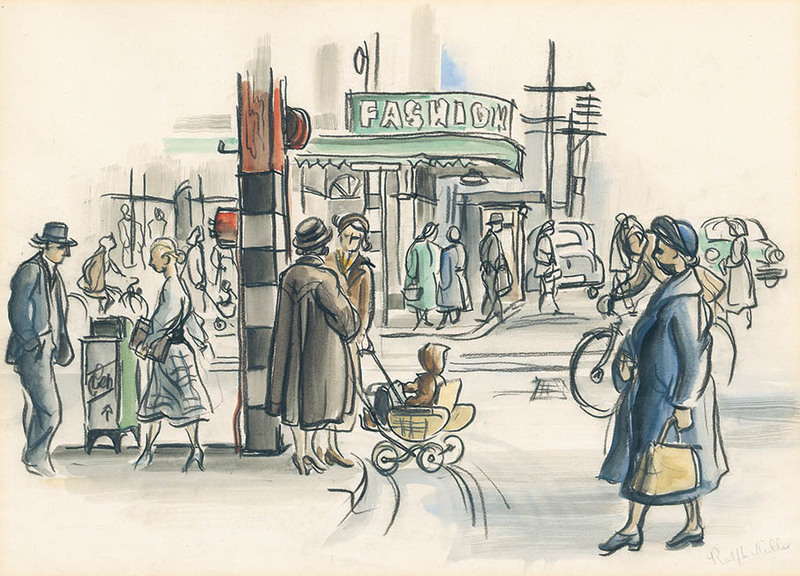 These Dowling Street buildings are early examples of Hislop’s work and he was only 25 years old when he designed them. He references Ross’s factory building in his treatment of the pairs of round-headed windows. 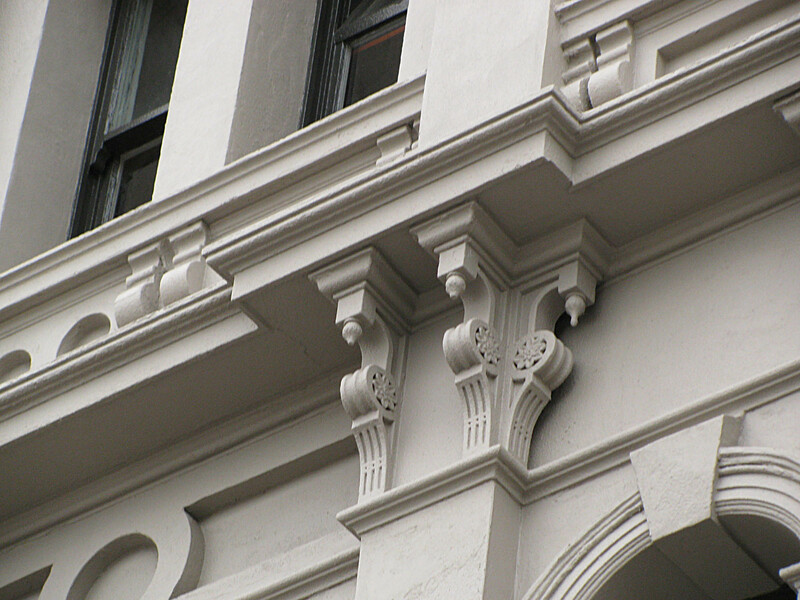 The proportions of the building are less like Ross’s work, with narrow bays (emphasising the vertical) and modest pediments. 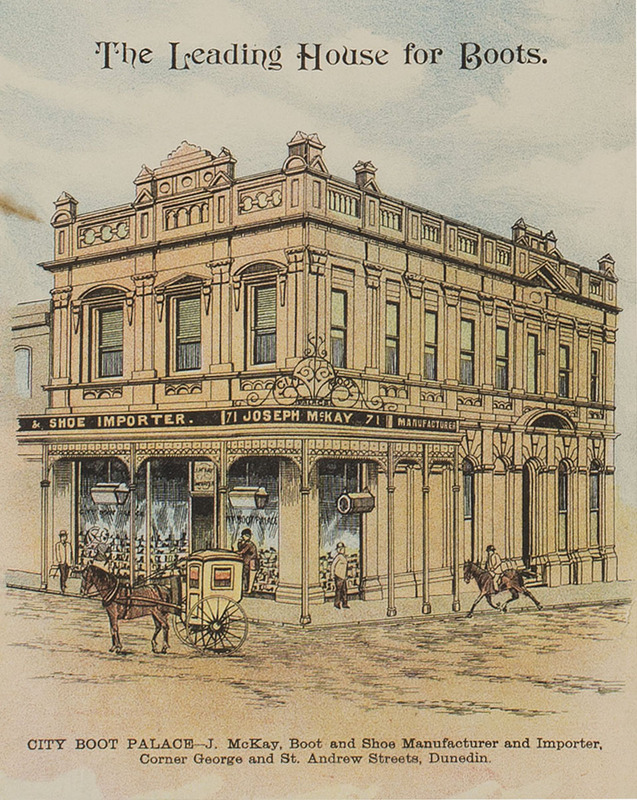 There was a curious incident in 1889 when it appeared as though Hislop was claiming credit (though he wasn’t) for the factory building next door and Ross (no longer a Dunedin resident) wrote a rather crotchety letter of complaint to the editor of the Otago Daily Times. The facade remains fairly unspoiled and recent painting in sensitive colours shows it off to good effect. The main alterations to it over the years have been the insertion of large glass shop fronts, the moving of the entrance doors, and the insertion of an odd-looking window on the first floor. 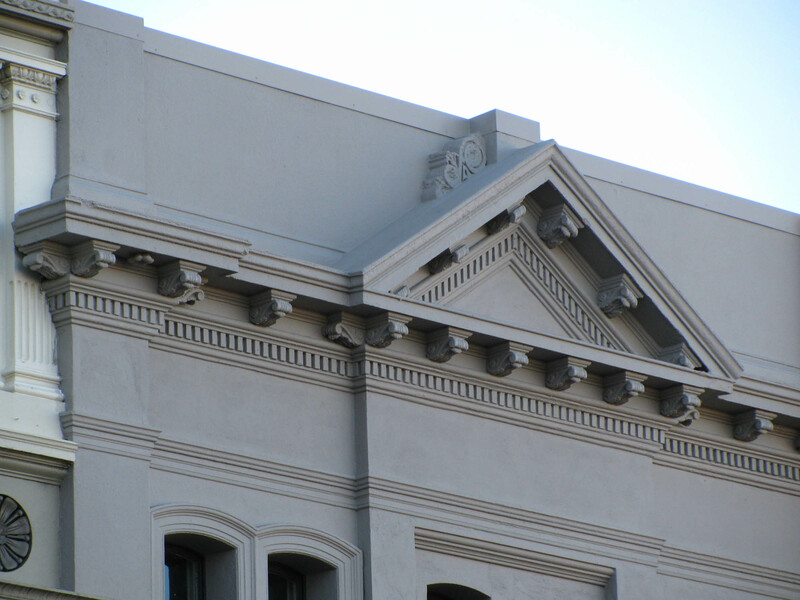 Finials above the pediments have been removed. Feldspar purchased the building in 2010 and have been busy carrying out improvements, including strengthening work. On 22 June I was lucky enough to join a group on a site visit to see some of the work that had been done. The upstairs interiors aren’t especially remarkable but have some attractive brickwork and timberwork and a lot of potential. It looks as though they will soon become very attractive spaces for commercial lease. Newspaper references: Otago Daily Times, 28 December 1889 p.6 (Ross’s complaint), 30 December 1889 p.2 (Hislop’s clarification), 26 May 1893 p.4 (Ahlfeld divorce case); Otago Witness, 14 June 1905 p.34 (‘Dunedin Police Scandal’). Other references: Cyclopedia of New Zealand, vol. iv, Otago and Southland Provincial Districts (Christchurch: Cyclopedia Company, 1905), p.344 (includes historic image); Bendix Hallenstein letter books (Hocken AG-296/005); Hallenstein Bros general ledger (Hocken AG-295-015/028); Hallenstein Bros leases and conveyances book (Hocken AG-295-038/001). This entry was posted in Buildings and tagged 1880s, Ahlfeld Bros & Co., Anderson & Godso, Bendix Hallenstein, David Ross, Dowling Street, Hallenstein Bros, James Hislop, Jewish community, Victorian, Warehouses on 15 July 2012 by David Murray.